I have not found a lovelier Hilda doll. This one strikes me as so pretty because her eyebrows are darker than most other Hilda babies. Kestner used size numbers on the dolls he made. The largest being a size 20. This doll has the size 18 incised so is the next to the largest version made. The way they attached a dome head to the composition body was with a coiled thick wire that ended up with a straightened portion going down through it with a hook on the end that was attached to the elastic cord that ran to the hooks in the legs and back up. The coil had to be rotated after putting the end into the hole at the bottom of the bisque head until the entire coil was up inside the head. There was no other way to get it in there because it was larger than the neck hole opening. If you purchase one of these dolls, the seller should still remove the head and stuff it to keep the sleep eye rockers from falling back into the bisque head and perhaps breaking it. I forgot to mention that the purpose of a seller removing and stuffing a bisque doll's head is only for shipping safety. Of course, then the buyer will replace it and enjoy the doll. Join in and write your own page! It's easy to do. How? 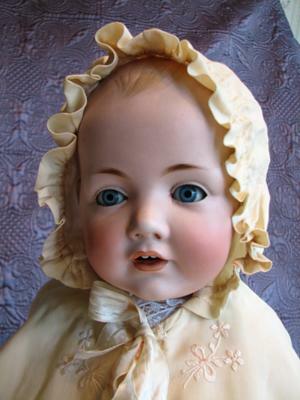 Simply click here to return to Kestner Dolls.